This peach smoothie recipe makes the perfect refreshing treat at any time of day. I made this delicious peach smoothie as a mid-morning post-workout recovery drink after my run, and it really did the trick. I was still kind of full from breakfast, so I wanted something light and fun. You’ll love the way this frozen drink instantly cools you down and makes you happy. What makes this peach drink so delicious? It has a special secret ingredient: mint. I already had fresh mint leaves leftover from my frozen mojito smoothie, another fabulous mint recipe, so I decided to throw some in. I couldn’t believe how delicious it made this smoothie! 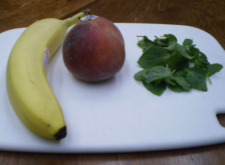 The combination of mint and peach give this peach mint smoothie an almost tropical smoothie taste to it, but there’s really nothing exotic about it: both grow locally in California and the USA. Mint is in season year round, while peaches are best in the summer. Learn more about peach nutrition. So don’t hesitate…make some refreshing peach smoothies for you and your friends today! 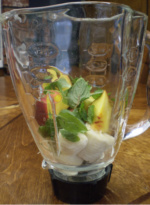 Add it all to the blender, push the blend button and go! Your drink will be ready in less than a minute. You’ll love the refreshing taste and smooth texture of this frozen drink. The mint has a strong flavor, so don’t go too overboard or the flavor will dominate. Add less mint if you are not such a fan of the mint flavor…I personally love it but not everyone does. 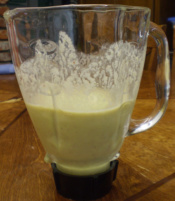 If you want to make this smoothie more filling and have it as a meal replacement, add peanut butter or protein powder. You can also try this fruit shake with milk, but I prefer it with water. It really brings out the flavor of the mint and peach, which I absolutely love. Did you like this peach mint recipe? Did you make any changes to the recipe? 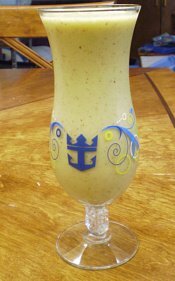 If you liked this peach mint smoothie, you'll love this peach and mango smoothie. Are you new to making smoothies, or want to get even better? 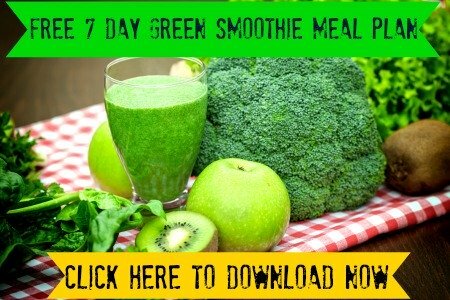 Learn how to make a smoothie! Find another fun tropical smoothie recipe at the tropical smoothie headquarters.